About one in five babies is born by Caesarean section. Two thirds of these Caesareans are unexpected, so you may find it useful to read this, even if you do not expect to have a Caesarean yourself. A Caesarean section can be just as satisfying as a normal delivery, and if it turns out you need a Caesarean section you should not feel that you have let yourself or anyone else down. The most important thing is that you and your baby are safe. A Caesarean section may be the best way to be sure of this. 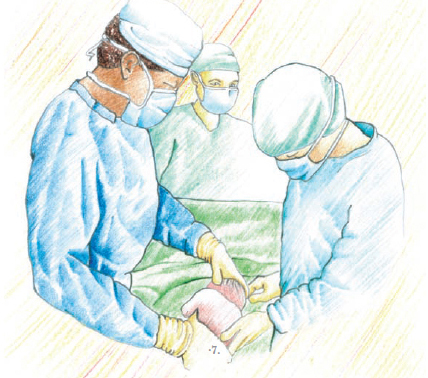 There are several types of anaesthesia for Caesarean section. This booklet explains these types and what happens during the anaesthetic. You can discuss the different types of anaesthetic with your anaesthetist. Obstetric anaesthetists are doctors who specialise ingiving anaesthetics to pregnant women. Your Caesarean section may be planned in advance – this is called an elective Caesarean section. Your obstetrician (the doctor who works with the midwives to care for pregnant women and to deliver babies) might recommend that you have one if they think you might have difficulties with a normal delivery. One example might be if your baby is in an unusual position in the later stages of pregnancy. In some cases, your obstetricians may recommend a Caesarean section in a hurry, usually when you are already n labour. This is an emergency Caesarean section. They might recommend this to you because your labour is going too slowly, because the baby’s condition is getting worse or a combination of both. Your obstetrician will discuss with you why they think you should have a Caesarean section and will get your permission for the operation first. There are two main types of anaesthetic. You can be either awake (a regional anaesthetic) or asleep (a general anaesthetic). Normally, if you have a Caesarean, you will have a regional anaesthetic. This is where you are awake but you can’t feel any sensation in your lower body. It is usually safer for you and your baby and allows both you and your partner to experience the birth together. This is the most commonly used method. It may be used in planned or emergency Caesarean sections. The nerves that carry feeling from your lower body arecontained in a bag of fluid inside your backbone. The anaesthetist will inject local anaesthetic inside this bag of fluid, using a very fine needle. This method works fast, and only needs a small dose of anaesthetic. A thin plastic tube or catheter is put next to the nerves in your backbone, and drugs to numb the nerves can be fed through the tube when needed. An epidural is often used to treat the pain of labour using weak local anaesthetic solutions. If you need a Caesarean section, the anaesthetist can top up the epidural by giving a stronger local anaesthetic solution. You would need a larger dose of local anaesthetic with an epidural than with a spinal, and it takes longer to work. A combination of the two. The spinal makes you numb quickly for the Caesarean section. The epidural can be used to give more anaesthetic if needed, and to give pain-relieving drugs after the operation. If you have a general anaesthetic you will be asleep while the obstetrician carries out the Caesarean section. General anaesthesia is used less often nowadays. It may be needed for some emergencies, if there is a reason why a regional anaesthetic isn’t suitable for you or if you prefer to be asleep. Normally you will visit the hospital before you come in for your operation. The midwife will see you and take some blood from you for tests before the operation. She will explain what to expect. Most women go home after the assessment and come back to hospital on the day of the operation, but you may need to stay in the night before. The midwife might give you tablets to reduce the acid in your stomach and prevent sickness. You should take one the night before the operation and one on the morningof the operation itself. This will be explained to you. The midwife will confirm the time of your operation and check that you have taken your tablets. Your bikini line may need to be shaved. You will have a name band on your wrist or ankle. The midwife may help you to put on special tight stockings (called TED stockings) to prevent clots forming in your legs. You will be given a theatre gown to put on. Your birthing partner, if you have one, can come with you and the midwife to the operating theatre. A midwife will provide them with special clothes for the operating theatre. The anaesthetist will have an assistant. There will be another nurse who is responsible for fetching extra equipment. At the very least there will be seven members of staff in the theatre. In theatre, equipment will be attached to you to measure your blood pressure, heart rate, and the amount of oxygen in your blood. This won’t hurt. The anaesthetist will put a cannula (a thin plastic tube) into a vein in your hand or arm and will set up a drip to give you fluid through this. Then the anaesthetist will start the anaesthetic. If you have a regional anaesthetic your birth partner will be able to join you in the operating theatre. They will be asked to sit down and to avoid certain areas of the room. You will be asked either to sit or to lie on your side, curling your back. The anaesthetist will paint your back with sterilising solution, which feels cold. They will then find a suitable point in the middle of the lower back and will give you a little local anaesthetic injection to numb the skin. This sometimes stings for a moment. Then, for a spinal anaesthetic, a fine needle is put into your back. Sometimes, you might feel a tingling going down one leg as the needle goes in, like a small electric shock. You should tell the anaesthetist if this happens, but it is important that you keep still while the anaesthetist carries out the spinal injection. When the needle is in the right position, they will inject local anaesthetic and a pain-relieving drug and then remove the needle. It usually takes just a few minutes, but if it is difficult to find the right spot for the needle, it may take longer. You will know when the spinal or epidural is working because your legs will begin to feel very heavy and warm. They may also start to tingle. Numbness will spread gradually up your body. The anaesthetist will check that it has reached the middle of your chest before the operation begins. It is sometimes necessary to change your position to make sure the anaesthetic is working well. The team will take your blood pressure often. While the anaesthetic is taking effect, a midwife will insert a tube (a urinary catheter) into your bladder to keep it empty during the operation. This should not be uncomfortable. The tube will be left in place until the next morning, so you won’t need to worry about being able to pass urine. For the operation, you will be placed on your back, and tilted to the left. If you feel sick at any time, you should mention this to the anaesthetist. A feeling of sickness is often caused by a drop in blood pressure. The anaesthetist will give you treatment to help this. Until the baby is born, you may be given oxygen through a transparent plastic mask to make sure the baby has plenty of oxygen before the birth. A screen will separate you and your birthing partner from the lower part of your body and the surgery. The anaesthetist will stay with you all the time. You may hear a lot of preparation in the background. This is because the obstetricians work with a team of midwives and staff in the operating theatre. Your skin is usually cut slightly below the bikini line. Once the operation is under way you will hear the sound of instruments and suction of fluids from around the baby. You may feel pulling and pressure, but you should not feel pain. Some women have described it as feeling like ‘someone doing the washing up inside my tummy’. The anaesthetist will talk to you while the operation is happening and can give you more pain relief if needed. Occasionally they may need to give you a general anaesthetic, but this is unusual. From the start of the operation it usually takes about 10 minutes until your baby is born. Immediately after the birth the midwife dries and examines your baby. A paediatrician may do this with the midwife. After this, you and your partner will be able to cuddle your baby and, in some cases, have skin-to-skin contact. After the birth, a drug called Syntocinon is put into your drip to help tighten your uterus (womb) and remove your placenta. An antibiotic will also be put into the drip to reduce the risk of your wound becoming infected. The obstetrician will take about another half-hour to complete the operation. Afterwards, you may be given a suppository (tablet) up your bottom to relieve pain when the anaesthetic wears off. After the operation, you will be taken to the recovery room where your blood pressure will continue to be monitored. Your partner and baby will usually be with you. Your baby will be weighed and then you can begin breastfeeding if you want to. In the recovery room your anaesthetic will gradually wear off and you may feel a tingling and itching sensation. Within a couple of hours you will be able to move your legs again. The pain-relieving drugs given with your spinal or epidural should continue to give you pain relief for a few hours. It is better to take regular pain medication when nurses or doctors offer it to you than to wait until you are sore. The drugs they give you won’t affect your baby when you breastfeed. These are some of the reasons why you may need a general anaesthetic. If you have certain conditions when the blood cannot clot properly, it is best not to have a regional anaesthetic. If you need a Caesarean suddenly, there may not be enough time for a regional anaesthetic to work. Abnormalities in your back may make a regional anaesthetic difficult or impossible. Occasionally, a spinal or epidural anaesthetic can’t be put into the right place, or doesn’t work properly. Most of the preparations are similar to those for a regional anaesthetic. However, your partner will not be able to stay in the operating theatre with you. You will be given an antacid to drink (to reduce the acid in your stomach) and a midwife may insert a catheter into your bladder before the general anaesthetic is started. The anaesthetist will give you oxygen to breathe through a face mask for a few minutes. Once the obstetrician and all the team are ready, the anaesthetist will put the anaesthetic in your drip to send you to sleep. Just before you go off to sleep, the anaesthetist’s assistant will press lightly on your neck. This is to prevent stomach fluids getting into your lungs. The anaesthetic works very quickly. When you are asleep, the anaesthetist will place a tube into your windpipe to prevent fluid from your stomach from entering your lungs, and to allow a machine to breathe for you. The anaesthetist will continue the anaesthetic to keep you asleep and allow the obstetrician to deliver your baby safely. But you won’t know anything about any of this. When you wake up, your throat may feel uncomfortable from the tube, and you will feel sore from the operation. You may also feel sleepy and perhaps a bit sick for a while, but you should soon be back to normal. You will be taken to the recovery area where you will join your baby and partner. An emergency operation is one that has not been planned for more than a day or two. How urgent it is can vary a lot. One that is less urgent can be done in much the same way as a planned operation, although you will only have time for one antacid tablet at most beforehand. On the other hand, some operations may need to be done very quickly. This might be within an hour of the decision or, rarely, as soon as possible. The most common reason for a very urgent Caesarean is if there is a sudden problem with your baby (sometimes called ‘fetal distress’). If you need a very urgent Caesarean, then the preparations that we would normally do may be changed or even left out. You will need a cannula (a thin plastic tube) placed in a vein in your hand or arm if you do not have one already. The team may give you antacid medication to reduce the acid in your stomach through the cannula rather than as tablets. You may be given oxygen to breathe from a tight-fitting mask. If you have already been given an epidural to give you pain relief during labour and it is working well, then the anaesthetist may try to give you enough anaesthetic through this for you to have an emergency Caesarean. They will give you a large dose of strong local anaesthetic so that the pain block is strong enough for surgery. The anaesthetist will have to decide whether there is enough time to top up an epidural, or give you a spinal if you do not have an epidural or if your epidural is not providing enough pain relief. If there is not time to attempt a regional anaesthetic, or there is not time for it to work well enough, you will have to have a general anaesthetic. If you have told the anaesthetist you would prefer a regional anaesthetic, the chances of having to have a general anaesthetic for a Caesarean are, for most women, very low. Only about one in 10 Caesareans is very urgent. There are several ways to give you pain relief after a Caesarean section. You can be given a long-acting painkiller with the spinal or epidural. In some hospitals, the team will leave the epidural catheter in place so they can give you more drugs later on. A midwife may give you suppositories containing pain-relieving drugs at the end of the operation. A midwife may inject morphine, or a similar painkiller. The team may give you a drip containing morphine or a similar drug. You can control the amount of painkiller you have yourself. This is called patient-controlled analgesia or PCA. A midwife will give you tablets such as diclofenac, paracetamol or codeine. Spinals and epidurals are usually safer for you and your baby. They let you and your partner share in the birth. You will not be sleepy afterwards. They will let you feed and hold your baby as early as possible. You will have good pain relief afterwards. Your baby will be more alert when it is born. Spinals and epidurals can lower your blood pressure, though this is easy to treat. In general they take longer to take effect, so it will take longer to get you ready for the operation than a general anaesthetic. Occasionally, they may make you feel shaky. Rarely, they do not work well enough, so the team may need to give you a general anaesthetic. Having a baby by Caesarean section is safe and can be a very rewarding experience. Many women choose to be awake for the procedure. Others may need to be asleep for the reasons discussed above. We hope that this booklet will help you to make the best choice for you if you find you need a Caesarean section. The risks of a regional anaesthetic are shown in a table below. The information comes from the following published documents. The figures shown in the table are estimates and may be different in different hospitals. Holdcroft A, Gibberd FB, Hargrove RL, Hawkins DF, Dellaportas CI. Neurological complications associated with pregnancy. British Journal of Anaesthesia 1995 – chapter 75, pages 522–526. Jenkins K, Baker AB. Consent and anaesthetic risk. Anaesthesia 2003 – chapter 58, pages 962–984. Jenkins JG, Khan MM. 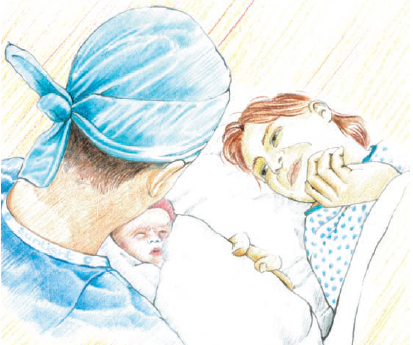 Anaesthesia for Caesarean section: a survey in a UK region from 1992 to 2002. Anaesthesia 2003 – chapter 58, pages 1114–1118. Reynolds F. Infection a complication of neuraxial blockade. International Journal of Obstetric Anesthesia 2005 – chapter 14, pages 183–188. Ruppen W, Derry S, McQuay H, Moore RA. Incidence of epidural hematoma infection, and neurologic injury in obstetric patients with epidural analgesia/ anesthesia. Anesthesiology 2006 – chapter 105, pages 394–399. LabourPains.com is the public website of the Obstetric Anaesthetists' Association. This information was written by the Information for Mothers Subcommittee of the Obstetric Anaesthetists’ Association. The subcommittee was made up of the following people: Dr Rosie Jones (chairman); Charis Beynon (National Childbirth Trust representative); Shaheen Chaudry (consumer representative); Dr Rachel Collis (consultant anaesthetist); Dr Rhona Hughes (Royal College of Obstetricians and Gynaecologists representative); Gail Johnson (Royal College of Midwives representative); Dr Michael Kinsella (consultant anaesthetist); Dr Makani Purva (consultant anaesthetist); Dr Ratnasabapathy Sashidharan (consultant anaesthetist). We would like to thank Dr Michael Wee (ex-chairman, Information for Mothers Subcommittee), Dr Roshan Fernando and Professor Felicity Reynolds for their work on the previous edition.